I’m just back from my third Namibia trip of the year, and my second to Etosha (it’s a tough gig, this travel journalism thing). I was last in Etosha in April, just after the rainy season. Visiting in October for the first time was an entirely different experience. According to my car’s thermometer, the temperature was sitting at an oppressive 40 degrees, even though it was 4pm. The light was harsher and whiter than in April, and the sparse, moonlike terrain was bone dry to the point where it was hard to imagine that anything could ever have lived here. Through much of the park, we didn’t find much to challenge that feeling. Large swathes were almost entirely deserted. And long gone was the greenery of April. But at the park’s many waterholes it was a very different story, and one that Etosha is world-renowned for. Our first waterhole experience of the trip came on arrival at Olifantsrus. 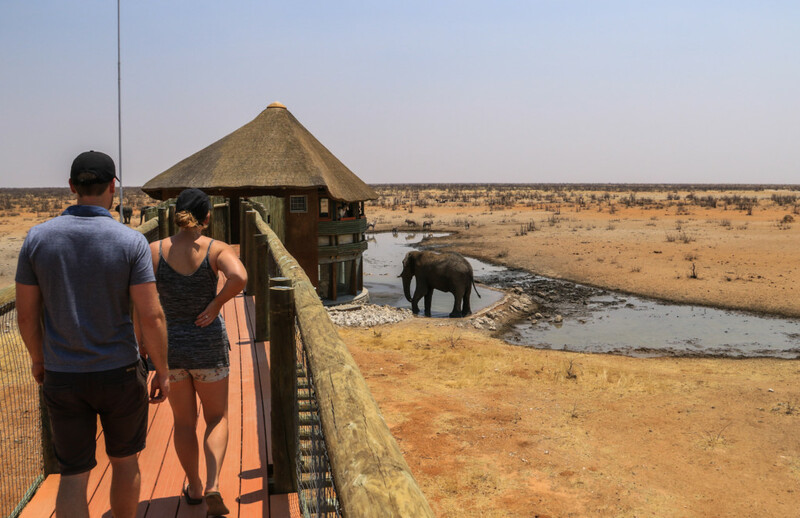 We walked along the wooden walkway to the hide that overlooks the camp’s waterhole to find a pair of black rhino, three elephants and a small herd of wildebeest drinking their fill. They were entirely unperturbed by the excited whispers in the hide above them. On our morning game drive the next day, we found three lions lazing near another waterhole, then elephants, ostrich and a big herd of gemsbok at the waterhole overlooked by Dolomite Camp. The following day we made our way back towards Okaukuejo, unaware that the best was yet to come. At the first waterhole of the day, a herd of springbok were disturbed by a giant dust cloud from the east. This dust cloud, it turned out, was generated by the unprecedented carnival of wildlife we found at the next waterhole. It was unlike anything I’d ever seen, and I’ve spent more time in the bush than most. I quickly counted eight different mammal species; there must have been at least 200 springbok, and similarly large numbers of gemsbok and zebra. Just moments after we pulled up and switched off our engine, the sea of animals suddenly parted in a mad panic. It took a while before we realised that there were five lions right in the thick of the action. Two young males were chasing another who had seemingly strayed onto their territory. One of them spectacularly rugby tackled the intruder and both lions tumbled through the dust for a moment before the intruder made off into the bush. 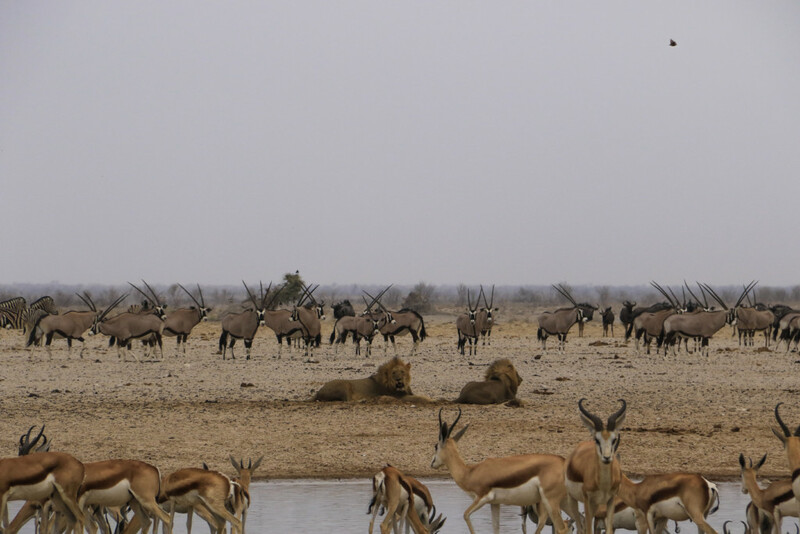 The remaining four lions settled down in the sand close to the waterhole, with a veritable buffet of buck drinking and milling about rather tentatively all around them. We eventually carried on to Okaukuejo and enjoyed some time in the shade by the pool, away from the relentless midday heat, before packing up the cooler box with gin and tonics for the evening game drive. We headed east towards Halali, skirting the edges of the Etosha Pan and spotting more lions, a lone elephant bull and a lazy spotted hyena taking an afternoon nap along the way. After a typically stunning Etosha sunset and a braai for dinner, we took the short walk to the camp’s floodlit waterhole and found eight black rhino drinking quietly while a herd of elephants with young ones in tow splashed around. A jackal appeared from the bush beside us, jumped up onto the wall, gave us a quick glance, and sprung over the fence and back into the park with ease, though his cool demeanour was somewhat disturbed when a male lion emerged from the darkness for his evening drink, sending the jackal scampering away at high speed. 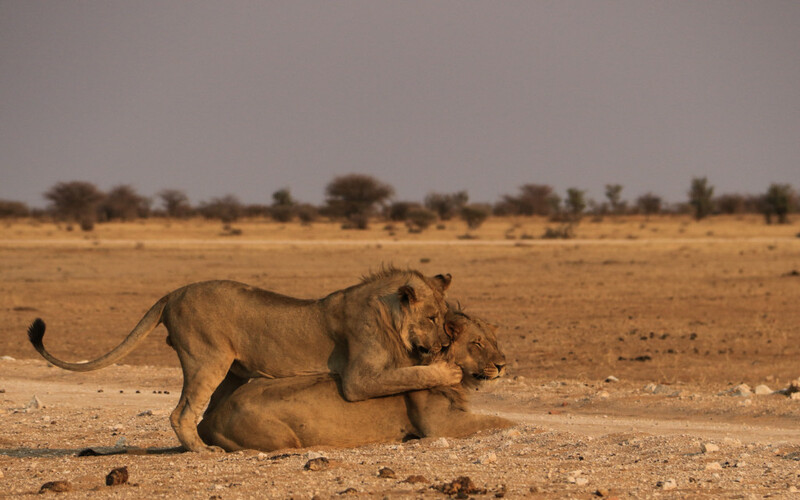 Just another average day in Etosha. Enjoyed this account a lot. We were in Etosha in April and will return next June. Doubt we could withstand the heat of October! Thanks for the vivid descriptions. My brothers and I are planning a trip to Etosha in August of ’18. Any sense of odds of seeing Cheetah? one of many highly coveted species we would love to see!